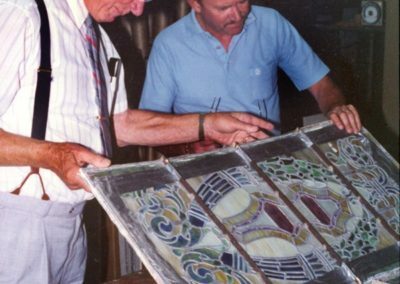 To restore the Tiffany American Opalescent stained glass windows, and conduct an investigation and decorative analysis in the main ranch house of this national landmark in Kingsville, Texas. 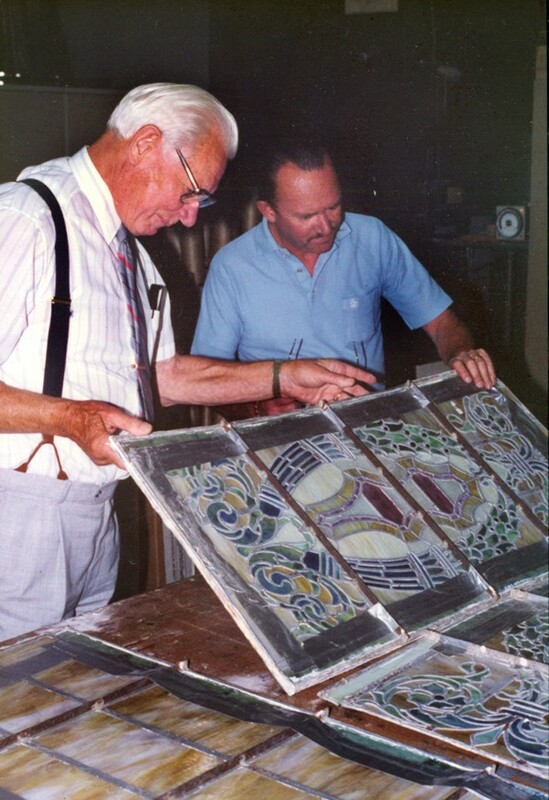 The Conrad Schmitt Studios was commissioned to execute the restoration of the Tiffany American Opalescent stained glass windows in 1989. 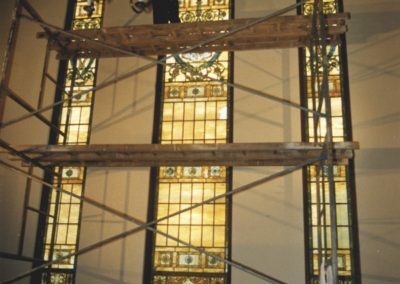 The restoration was interesting not only because it was a Tiffany but what added to the charm of the project was repairing any piece of Tiffany glass that had a bullet hole through it. The story has it, that one night after a long cattle drive, the Kinenos went to town to celebrate. The Kinenos cowboys rode back to the ranch and awoke the rest of the family by shooting holes in the windows. After initial investigation, analyzation, documentation, and photographing under natural and artificial light conditions, the windows were carefully removed from the west exposure when the temperature was 115 degrees Fahrenheit. They were crated and shipped to the Studio for further documentation and restoration procedures. 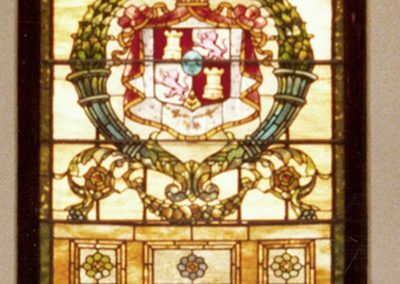 After the staff agreed upon the methods of restoration, the window as well as the cracked pieces of glass, including those with single holes through them, were disassembled. According to policy, all panels had two sets of rubbings. Matching the glass was not difficult since the Conrad Schmitt Studios possesses some of Tiffany’s original glass. 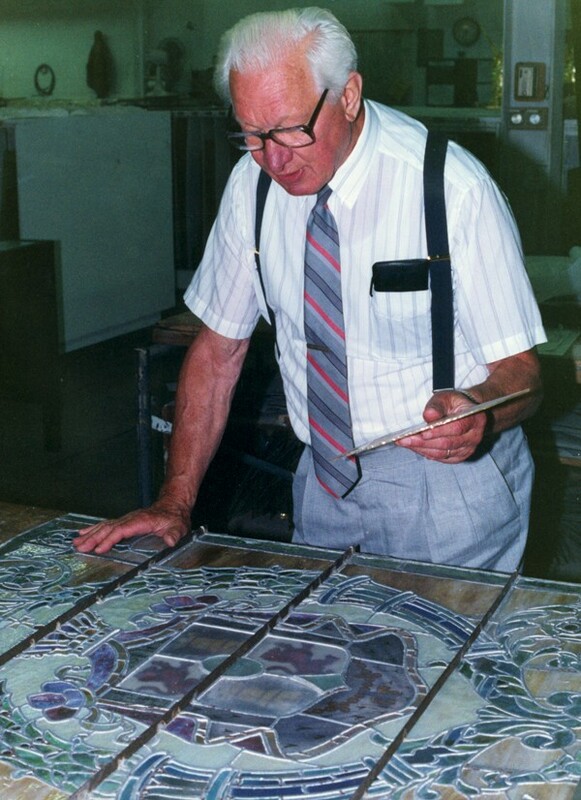 CSS carefully cleaned the glass, examined the lead, replicated the lead and broken glass with original Tiffany glass from its inventory, re-glazed the panels, and epoxied cracked pieces of glass. 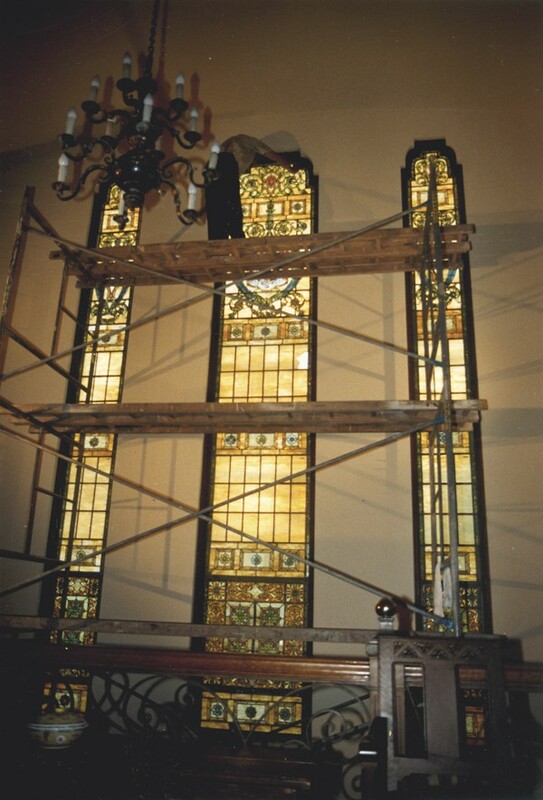 When reinstalling the windows, the pieces that contained the bullet holes were framed with lead and presented to the heirs of the sons and daughters who created the original damage. These windows are the focal point of the house overlooking the courtyard. The main house is built in the shape of a huge square surrounding a courtyard filled with palm trees, flowers, and fountains. At night, mariachi bands, once again, play beneath the restored Tiffany windows entertaining guests from around the world. 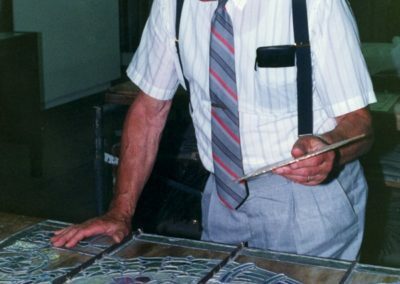 Conrad Schmitt Studios conducted on-site color investigations and decorative analysis of previous paint schemes of 28 rooms at King’s Ranch in March, 1989.